I have to admit that the first things that struck me about the Burson Soloist were the finish and the weight. The latter I noticed even before I opened the box, given how heavy it was, and I didn’t realize how badly I remember the size of the last Burson products I saw (the 160D and 160A). I loved how the aluminum chassis is nicely machined, the knob polished, very clean yet well short of being a chrome-dome eyesore. 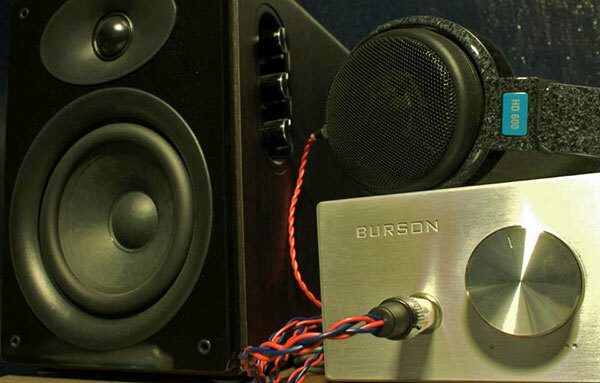 I set it up right next to my amplifier, a Meier Audio Corda Cantate.2, and both are oriented differently – the Burson deeper while the Meier was wider – but handling either with one or even both hands will always remind you of the heft of the power supply in both amps (the Burson more than the Meier). In any audio equipment, that’s generally a good sign. 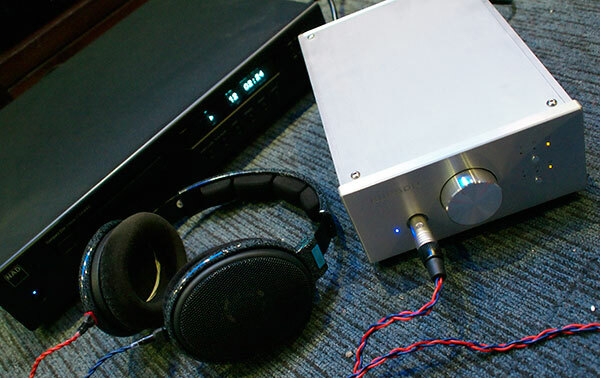 The Burson didn’t have its own DAC, but I had a loaner D-Zero at home, and tried it with both over a month, as well as an hour or so with other borrowed sources. No need to worry about its power output – it had enough grunt to push my HD600 and an LCD-2 without noticeably losing impact or output level. If I would summarize it in a word, I’d say it’s for the most part unremarkable, but I mean that in a positive way. I didn’t immediately feel that it was adding or diminishing the input signal in any way and was able to show well enough the differences between the sources I used with it. For example, among all the sources I tried, the D-Zero was obviously the least capable; considering its price and it comes with a built-in battery for portable use, however, it isn’t too bad. On its own – and I tested it first – it actually seemed good, other than being a bit too soft with the impact of the percussion and somewhat warmer mids (which I’ve also noted on the Cantate, where I used it first). The Marantz 5003 for example was noticeably warmer in tone, but the lower mids until the higher range of bass notes were a little too forward. Kick drums in Dream Theater’s Images and Words album seemed to put the percussion slightly ahead of the rest of the band, with the bass drum way out in front, the other pieces only slightly so. It reminded me of the Cambridge Audio 540C that I tried with my Cantate last year. This might not be immediately apparent in speaker systems, if not a plus for subjective evaluation given most standmounts’ lack of bass extension, but on a headphone that extends further and sitting right outside the listener’s ears, this becomes an issue. Yes, I’m using the relatively newer pads on my HD600, so it can’t be that. Also, drum rolls seem to go from one side of the soundstage, with a relatively weak center, before getting louder when it gets to the next side, implying the need for a little bit of crossfeed processing. The NAD C545 fared a bit better. I felt there was more extension in the bass, given the audible reverb coming from playback of Mozart’s “Confutatis Maledictis,” as well as in other modern music tracks; however this did not come at the cost of the bass drum being out of place in the soundstage. Also, the percussion had a fair bit of “crunch” to the sound, kind of what a snare or tom will sound like tonally if you were listening to it in the same room, and while it didn’t seem too forward at first, but once I swapped over to the Cantate, it seemed a bit fatiguing. I’ve been listening for a while at this point so I couldn’t yet say for sure if the Burson was just warmer or if my ears were just aching for a rest. Another two weeks alternating between the Burson and Cantate, both on the D-Zero, every couple of days or so and I began to notice that the Burson seemed warmer. On back-to-back listening (which of course isn’t as instantaneous as I’d like) I note that there could be an upside as some guitar passages were more forward. The electric guitars on the intro of Nightwish’s “Astral Romance” was audibly warmer on the trailing edge of the notes, as well as less likely to fade out behind the other notes in the mix. However between the Burson and D-Zero vs the Cantate and its own, more bare-bones PCM2704-based USB DAC, I generally preferred the latter as it didn’t soften the impact of the percussion. Just to be fair, for anyone who believes in cables anyway, I’m using a 1m-long hardware store 3.5mm to RCA interconnect with the D-Zero, as opposed to the Cantate’s USB DAC that doesn’t leave the box (barely moves out of the circuit board, even). There were however two headphones where the Burson’s added grunt (even on low gain to match the Cantate’s, as I haven’t tried to force the screws open to switch to high gain) was of immediate benefit : the Beyer T1 and the Q701. Not only does the Soloist not need to get to the end of the volume knob’s rotation to get to a louder than normal listening level, but the sound remains clean, very dynamic and with great transient response. The Cantate on low gain can just barely get the T1 loud enough unless you are sitting pretty much alone in the room. It does a lot better with the K701 I tried before, and in fact I really liked it, save for when I tried a Q701 with misshapen pads (where the thicker sections were on the top of the ears – which had an unnatural midrange-treble transition and a weird soundstage). 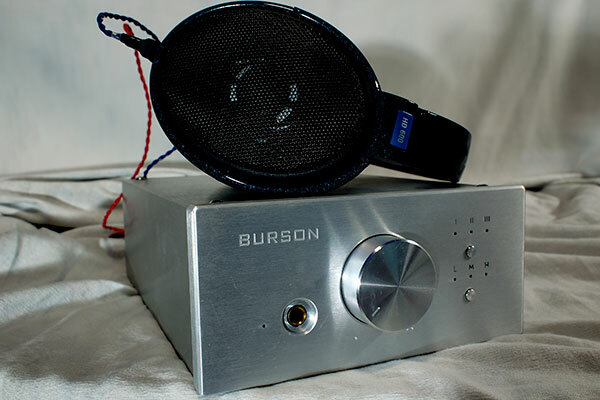 The Burson on the same Q701 demo unit, albeit with the pads somehow installed correctly although slightly evened out with wear, however, was another matter entirely – I’ve never listened to an amp that can drive a 701-series headphone like a king of an equestrian military taking the reins on a stubborn horse captured from another group (more of Ieyasu or Alexander whispering to then controlling him well than, say, Shingen or Genghis breaking in a wild stallion). The bass reached low, hit hard, and hit fast – there was no compromise to favor one over the other. 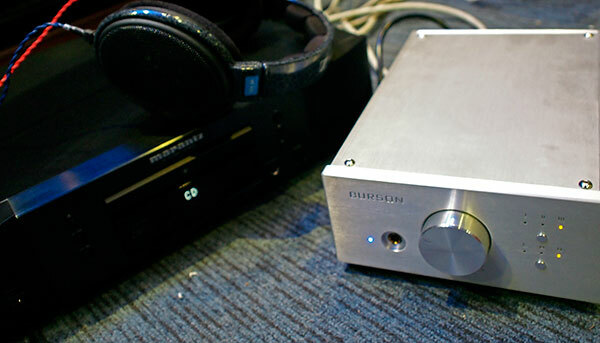 If anything, the only compromise was what you’d make with a headphone to begin with, and that it doesn’t give a lot of depth, but in fairness, the two times I’ve heard a headphone with that much stage depth, the K701 on a tube amp and NOS DAC was doing the weirdest things to the soundstage. 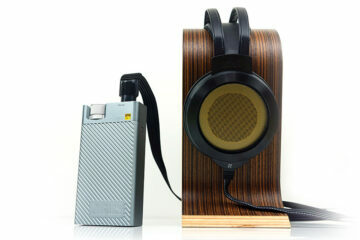 The other time was a K1000 (and that’s basically a pair of speakers hanging on a headband). Even with just my Android and the D-Zero, and for less than an hour thanks to our trip to the DFA Consular Office satellite in the same mall, I cannot forget how great that system was – it was everything I liked about the Dynaudio Contour S5.4 driven by monster amps I didn’t ask the price for, although scaled down to the size of a headphone, in terms of form factor, soundstage size, and of course, price (except maybe for Stax). Still, the Soloist isn’t perfect. Remember how I noted it sounded like was slightly coloring the output, more noticeable on the HD600? I hooked it up to my workstation system, which normally uses the D-Zero as a simple (but smoother than Realtek) DAC for my notebook feeding a pair of Swan D1080MkII 08 active speakers. Yes, the speakers have their own easy enough to reach volume control, but hey I had the Soloist and I didn’t have a full-size system to try it on. I immediately noticed it seemed warmer than with just the D-Zero and the D1080’s. I swapped out the cables, which again is far from as instantaneous as I’d like, but the added warmth was there nonetheless. From a technical standpoint, this is not a good thing, obviously – the pot for whatever they chose it for given the stepped design might actually still be adding that little bit of color to the sound. However, as I used it then, I got over the nitpicking very quickly as hours passed as I worked on my MA thesis and I noticed less listening fatigue. Usually I listen with the speaker covers on, but I took photos of the Burson together with my speakers, and it took a while before I realized the covers were on the table. Being able to hook up the headphone right away when the clock went past 12MN, or to take it off when I get home early on a weekend and my neighbor is blasting Gangnam Style so I can counter with either Motley Crue and Behemoth or Late Night Alumni and Kaskade (now you know why I don’t use shuffle play mode) was just really convenient. A day before I returned the Soloist I was able to get a pair of 0.5m Monoprice 3.5mm to RCA IC’s, which I originally ordered to keep my set-up neat (not to mention it was only about $1+group buy shipping rates more than the 2m hardware cable I’ve been using) and the plugs looked nice, I immediately noticed that what I’ve been noticing as added “warmth” on this amp wasn’t there anymore. I did a brief back to back test (regrettably not a blind test however) and sure enough, there was still that hint of warmth on the cheaper, four times longer cable. I can’t test it on the Cantate for comparison now, however, as it conked out a few days ago and I can’t even bust the fuse out (I’d rather let a more experienced engineer/technician work this), but for now my working theory is that the cable is just too long and probably not pure copper that it might have been affecting the signal. Also, given some people tend to prefer warmer sound, I’m not surprised why some cheap cables win out as much as there is a tendency for “clear, flat-sounding” sources and “transparent” amps to lose to “warm” gear for some people. Suffice to say though the Cantate might actually sound too lean on this cable. If I had $1000 I’d probably get this amp, even if I already had an amp I’m happy with . I wouldn’t sell my Cantate (even if its in its box waiting for professional diagnosis and repair) to help fund the purchase given its one-box set-up next to my low- slouchy listening chair, but nevertheless, I’d happily recommend the Soloist to anybody (with $1000) looking into getting a really nice amplifier with lots of clean power. Oh, and by the way – normally I wouldn’t spend a lot more on an amp over the price of headphones or speakers I’d use them with, but damn, I would highly recommend it to anyone with a 701-series headphone, and that’s even if you can get the Q701 at Amazon prices without paying import duties (which hovers around $250). Granted I haven’t listened to the much-touted Heed, but apart from that I haven’t really listened to an amp that really woke up the dynamics (instead of coloring the lower midrange) of the Q701 – really open throughout the whole frequency range, percussion hits are clear and hit low enough but the midrange isn’t anywhere near being artificially warm. The AKG K618DJ – Another Beats Slayer?